Why should we eat prunes every day? Prunes are in addition to their phenomenal taste that few resist, known for their outstanding laxative effect, and the people use them for problems with constipation. Specialists are now increasingly recommending it as a cure for osteoporosis, because they provide strength bones and makes them less brittle. They are appreciated when it comes to dieting, because they are very effective in removing excess weight. 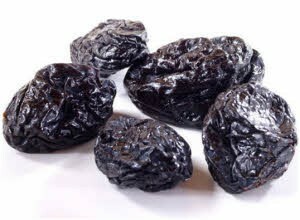 In this article learn more about all of the above as well as additional reasons why you should eat prunes every day. What is the nutritional and caloric value of prunes? This precious fruit is rich in fibre, which are very important for good digestion and bowel movement. This is why prunes against constipation are suitable for various stomach problems, particularly if you have a problem with irregular bowel movement and chronic constipation. Paediatricians often prescribe it to young children and babies, in the form of a mild juice to establish normal peristalsis and eliminate the occurrence of stomach cramps. If you are wondering whether prunes contain calories and how much, and what is their value nutritional value, know that in 100 grams of dried fruit there is between 150 and 230 calories and almost 35 percent of sugar (fructose and glucose). In addition, significant amounts of fibre can be found in them between 10 and 16 grams, which is significantly higher by 2 percent compared to fresh fruit, and are therefore particularly praised by nutritionists. Thanks to the natural sugars (glucose and fructose) it can quickly make us feel full and alleviate hunger and discomfort in the stomach. That is why the prunes for weight loss are more than good. If your grandmother at least once in a lifetime advised you to eat prunes against constipation because of their laxative properties she was certainly right. In 2012 European health authorities formally recognized that these delicious fruits have a positive impact on the bowels and in the cases of constipation and hard stools it is advised to take 100 grams of dried plums per day, but that is not all! A spoon of senna fruit crush and cook for a good fifteen minutes in 3 dl of water. Remove from heat and let the tea cool downs. Then strain, after which the resulting liquid should be stirred with two large tablespoons of plum jam. Thus obtained natural remedy for constipation, drink only in the evening. If you have the above mentioned problems, a very good solution for you is chamomile tea in combination with 10 or so dried fruits. Also instead you can eat stewed prunes with the addition of dried figs that make a great contribution. That the prunes are more than good for digestion, was known much earlier, however, this valuable dried fruit has many other good qualities that we will share below. A study conducted by Bahar Ardžmandi, an expert from the University of Florida showed that prunes are very useful for bone health. In fact, they protect against fractures after menopause. This research shows that women who are in menopause 1-10 years of age (the age when the risk of osteoporosis are by far the largest) just 50 to 100 grams of dried plums per day, can lead to a renewal of bone mineral density. In other words, these fruits reduce the risk of fractures and help us to strengthen bones and preserve the health of the skeletal system as a whole. Therefore, forget the usual unhealthy snacks and instead eat daily 5-10 prunes. In what way they protect the bones? Dried plums do not contain calcium, which means that their effects are quite different. In fact, some studies in recent years have shown that these tasty fruits mitigate inflammation of cells, which deposit minerals in the bones. The protective effect comes from the large amount of polyphenols contained in these fruits, and vitamin K and manganese. "After more than 30 years of research," says Ardžmandi, "I am satisfied that for the optimum maintenance of proper bone density, there is almost nothing better than domestic prunes". This scientist is certainly right, so advice to everyone - do not exclude prunes from the diet, on the contrary, be sure to consume them every day in recommended doses. Thanks to the abundance of polyphenols and valuable fibre, prunes have been able to keep cholesterol levels under control, for a long period of time. Currently there are no serious studies or scientific evidence for this claim, but it is thought to have a beneficial effect on women who are at the beginning of menopause, because then they usually encounter unusual increase in blood cholesterol levels. In this case, it is recommended to take a dozen of prunes a day, as long as its value does not return to normal. Polyphenols not only protect bones, but the system and act against the aging process, and prunes are rich in fibre such as pectin, then vitamin B6 and valuable elements such as copper, potassium (regulates blood pressure) and manganese. This medicinal fruit helps with diabetes, protects our heart and blood vessels, and has an extremely laxative and diuretic effect. What is the price of prunes in stores? The difference in the price of fresh and dried plums is very noticeable, sometimes this is 1 to 10 in favour of dried fruits. You can find one on the shelves of almost every major supermarket, but it is our recommendation that you still buy them at health food stores from trusted manufacturers. Packaging of pitted prunes of 200 grams is priced from 2 to 3 dollars, and you can search for it in the better-fitted web stores. How to unclog your nose with plum pit? A prominent doctor Piero Moci considered a plum a natural super cure with no real competition in nature. This tells us that it would be ideal to take two or three a day, which would apply equally to all blood types. In addition, the famous doctor advises us that in the case of nasal congestion, hold in the mouth the pit of fruit, at least 20 to 30 minutes and the nose will naturally unclog. Besides it will also have a positive effect on the cough. You ask, how is that possible? According to Moci, it contains substances that relieve inflammation. Do you need more reasons to incorporate dried plums in the daily diet?